When I went to bed last night, my mind was set on what I wanted to do today. After being in the woods all day on Sunday in the pouring rain, I found a piece to the puzzle that I had been missing the last few years. I gathered my stuff around to make sure I had everything I would need when I walked out the door from work. Throwing it into the backseat of my truck, I felt like I was ready for a good afternoon. It was chilly with a brisk north wind. All day I sat at my desk and imagined where the buck would come from to freshen the scrapes that I had found on Sunday. After the all-night rain and windy conditions today, I had a feeling that the buck would be poking around in his territory to get ready for the upcoming breeding season. After pulling into my parking spot, I started digging through my hunting clothes. Suddenly, I discovered that I had forgotten my hunting pants. Since it was chilly, I considered calling it a night. I had piles of work to do before leaving for the Midwest on Thursday afternoon. I hemmed and hawed about it for a few minutes before deciding to grin and bear it. Although blue is a really bad color to wear while hunting, I didn’t have many options. Yes, the deer can see blue better than any other color, but having a rifle in my hands, I decided it would be too late for the deer if it had a chance to see what I was wearing. Sliding my rifle out of the case, I realized that I had forgotten my bullets. I fumbled around through the side doors, the console and under the seat to find four bullets. The evening that I had been looking forward to since the season started was suddenly turning into a disaster. What else could go wrong? My hike into the woods brought me back to when I was 14 years old when my dad and I would walk around the backside of the mountain to avoid kicking deer off from the top of it. Somewhere along the way, I had forgotten my roots and started doing things differently. Today I made sure to follow the example that had been set for me almost 35 years ago. Although it would take me considerably longer to get to the place I wanted to go, I decided to go the long way to ensure I could put the final piece of the puzzle into the place that interlocked with the other pieces. I made sure to walk slowly and cautiously when I neared my desired destination. I peaked over knobs, looked through blowdowns, peered through the leaves and strained to look down a few steep ridges along the way. Finally, I found an old pal, the tree I sat under a number of times in the late ’90s. Since that time, I have only sat under it a handful of times, one being when I killed a nice 4-pointer there around the year 2000. After all, I hadn’t had much reason to sit there the last decade or so. There hadn’t been enough sign to warrant sitting there, but the sign I saw on Sunday beckoned me to return and give it a shot. The wind was blowing in a perfect direction when I sat down. The couple of places I expected the deer to come from were free and clear from my scent. After taking a few sweaters out of my backpack and resting one over my legs to cover up my BlueJeans and keep my legs warm, I got ready to settle in and enjoy the things the woods has to offer. I would only be there for two hours, but that two hours is what I needed today. An hour into my sit, I heard a stick crack in the bowl below me. Peering over a huge boulder, I could see a big buck feeding toward me. 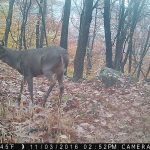 I quickly ducked down and rested my rifle on my knee.Waiting patiently for the buck to appear in front of me, I became anxious and tried looking over the pile of rocks. He was still coming, and he would be clear of any obstructions in the next few seconds. When he became level with me, I applied pressure on the trigger until a deafening boom broom the silence in the big woods. He instantly fell to the ground, and the hunt was over. I had completed the puzzle that I set out to solve. Although it felt unbelievably rewarding, I was saddened, too. When you catch up to a deer you have been pursuing, it’s a chess match that you want to win, but when you win it, you know you have taken an animal’s life that has gained all of your respect. It’s a feeling that can’t be explained to someone who doesn’t have the intimate connection to the animals he is pursuing. My hunting season for deer in New York is now over until late muzzleloading season. When I return from the Midwest, I’m going to try my hardest to fill my bear tag since there are a lot of bears in the few areas where I hunt. I’ve gotten a lot of pictures of them in the past, and I even saw one this year. I’m hoping I can put it together and catch up to one of them. 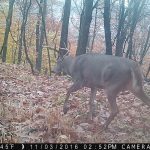 Here are a few pictures from the hunt for this deer. 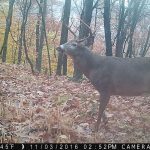 His rack put on some inches in all areas between this year and last year. He even put on some weight. He dressed out at 185 lbs, which made it a chore getting him out of the woods. My buddies Doug and Blair helped me with the chore. I didn’t get home until midnight, and it didn’t help that Doug locked my keys in the truck. When we were done dragging and loaded the buck into the back of the truck, I pulled the door handle to get into the vehicle. When it didn’t come up, I knew we were in trouble. Eventually, Doug and Blair found some stuff to pick the lock. Without any service in the area, I thought we were in serious trouble. I’m thankful for good friends helping me out when I need it the most, especially tonight. This entry was posted on Saturday, November 18th, 2017 at 4:59 pm and is filed under Uncategorized. You can follow any responses to this entry through the RSS 2.0 feed. You can leave a response, or trackback from your own site. Congrats on filling your New York tag! Great buck!